Somerwoods Nursing and Rehabilitation Center’s use of the neighborhood concept presents a more desirable setting for a variety of patients. Areas of the facility are “specialized” for clinically complex, traditional long-term custodial care, rehab-to-home and cognitively impaired. The physicians, patients, families and referrals/tours appreciate that patients in each neighborhood have similar circumstances and the area is designed especially for them. Our Rehab-to-Home Neighborhood has a large gym with some “fun” equipment as well as traditional equipment. The Custodial Care Neighborhood has a homelike feel with carpet, a formal dining room, as well as a kitchenette, coffee station and dining table where residents sit and read newspapers, socialize, and play games. The Clinically Complex Unit is staffed with more nurses and has a feeling of a healthcare setting. It has a restorative nursing room and the social gathering areas are smaller. 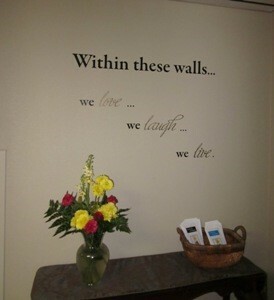 The Memory Care Unit is designed for the cognitively impaired. This unit promotes freedom of movement and interaction with the environment.